NEXT | Hearthstone's April card back revealed: Cupcakes! Machinima artist SlightlyImpressive is back with another WoW creation, this one pointing out six perfectly normal, everyday things that you simply can’t do in World of Warcraft. The first is blatantly obvious, but as the video moves on it points out a few things I hadn’t really given much thought to, and one thing I have — ladders. We can’t use ladders. 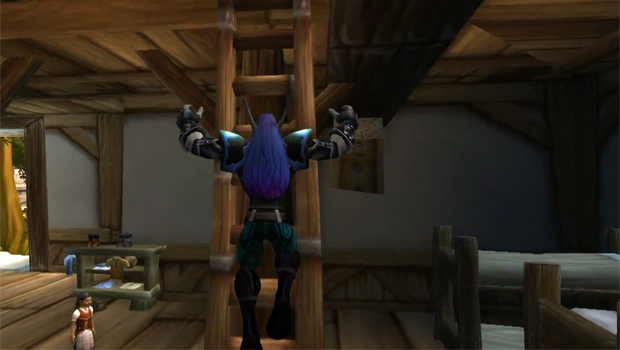 We have ladders all over the game, and although our characters are perfectly capable of defeating any threat posed to Azeroth and beyond, we still haven’t figured out rungs. It’s a little weird, don’t you think? But number six really made me think, because I hadn’t really sat down and thought about it before. They never, ever leave. Ever. I can’t decide if that’s sad, or just some really heroic dedication. You can watch the video in full below — and if you like this one, be sure to visit SlightlyImpressive’s Youtube channel for plenty more where that came from.